This Go Nuts Hawaii Surf Camp is located at the famous V-land beach. You will surf on some of the best surf spots in the world, always according to your prior surf experience. You won't miss any bit of the amazing North Shore's winter surf sessions. Where else in the world do you have the chance to see the top surfers of the planet competing on some of the largest and the most amazing waves on earth? You will be accommodated at five bedroom house across the street from one of the most prestigious surf spots in the world " Valzyland". Every day, you have a lesson in the morning and after a light breakfast, there is a surf lesson or a stand-up paddle board lesson for about one and a half hours to two hours. Surf lessons are available for all levels. This retreat is located right in the world renowned North Shore of Oahu and the surf spots are Valzyland, Sunset Beach, Pipeline, and Waimea to name some of it. In December, The Hawaiian Triple Crown is held here consisting of three contests, which are Haleiwa, Sunset, and Pipeline that traditionally end the professional tour's season. It is just 0.6 miles from Sunset Beach, a prime location if you want to live and breathe at the same pace with the most famous surfers in the world. The North Shore of Oahu is world famous as the surfing capital of the world. In the winter season, especially from December through March, giant swells generated in the north Pacific produce the most consistently spectacular waves in the world attracting tourists and surfers from all over the globe with an amazing number of popular surf breaks lining the coast. The most famous surf breaks are the Banzai Pipeline with its awesome tubes and Waimea Bay with its 20 feet plus rideable waves. 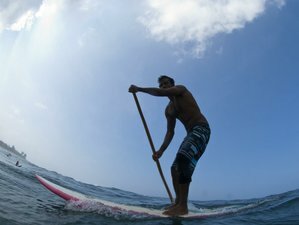 Go Nuts Hawaiis professionelle Lehrer heißen Sie willkommen zu Surfunterricht für Kinder und Erwachsene auf Anfängerniveau.